The exciting new ship has now upped it's game. Source: Virgin Voyages. Richard Branson’s venture into the cruising world continues to grow as a new and exciting addition to the cruise line’s first ship has just been announced. 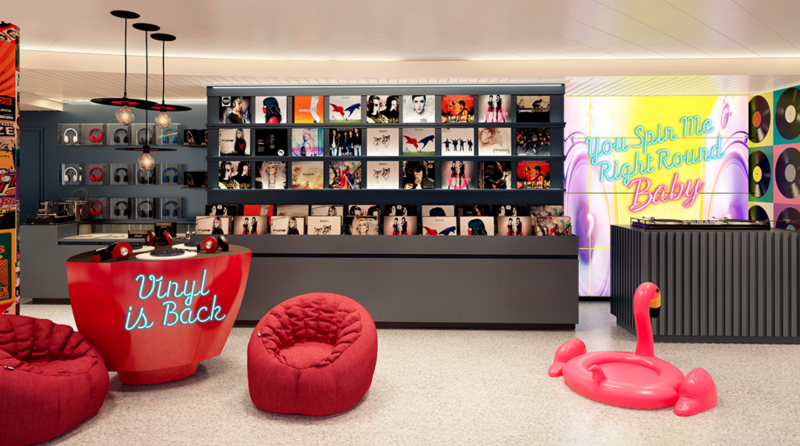 Along with several tantalising services and activities already announced for the vessel, Virgin Voyages’ ship, The Scarlet Lady, will also sport a record store and karaoke lounge for passengers’ enjoyment, meaning you can embrace your inner Celine Dion at sea. The record store, aptly named Voyage Vinyl, will be the go-to spot for all music lovers on board while the karaoke and gaming lounge, The Groupie, will play curated music and host performances by up-and-coming artists. The cruise line will also have a residency program for artists, such as DJ Mark Ronson (whose song ‘Uptown Funk’ was a huge hit in 2014) to regularly perform for passengers at in-port destinations. The Japanese-inspired karaoke room. Source: Virgin Voyages. Passengers will be able to enjoy personal listening stations in Voyage Vinyl as well as purchase limited-edition curated albums, special editions of classics, magazines, headphones and record players. Meanwhile, in The Groupie, a modern Japanese-style karaoke room can be booked for groups to let their hair down and sing along to their favourite tunes. The musically dedicated areas on board might seem out of left-field for a cruise ship, but they’re actually not too surprising given Virgin’s early start in the music industry. Virgin Voyages’ said the “sonic identity” of the ship will come to life through the unique energy of each space. The cruise line is taking a fierce approach to music and will blend timeless classics with music from rising artists to set the mood on the ship and help passengers feel all the more groovy while sailing the high seas. Voyage Vinyl, the old-school record shop onboard. Source: Virgin Voyages. However, for those who are more interested in sitting back and relaxing, there will also be a range of calming sounds to accompany moments of rejuvenation. The highly anticipated cruise ship is due to set sail in 2020 for its maiden voyage from Miami to the Caribbean. Along with the newest musical addition, Virgin Voyages has already confirmed all-inclusive fitness classes along with an outdoor athletic club and indoor gym, a private outdoor lounge, more than 20 eateries, a thermal spa and a communal relaxation area onboard. The ship first made headlines last year when Virgin announced the cruise would be exclusive to adults with a restricted age of 18 and over for all passengers. Virgin said the ship would be somewhere passengers could enjoy “the best possible experience, sans the unpredictability of kids”. At the time, the kids-free experience was one of the first of its kind in the cruise industry, however this recently changed when Temptation Caribbean Cruises announced the release of yet another adults-only ship however this time with a raunchy, Fifty Shades of Grey inspired twist. Although The Scarlet Lady is the first ship for Virgin Voyages, the new cruise line already has four more ships on order. Do you like the addition of the music rooms onboard? Would you go on this cruise?